Review the Vendor Handbook before applying to a Nourish Knoxville Market. No resale is allowed by any vendor at any Nourish Knoxville Market. If you did not make it, grow it, or produce it, you cannot sell it. Occasionally collaborative efforts may be accepted with prior approval from Nourish Knoxville. Vendors may only sell products approved through the application. Additional products can be added with prior approval. Every Thursday (3 pm – 6 pm), April 18th through November 21st, 2019. Every Wednesday (11 am – 2 pm) and Saturday (9 am – 2 pm), May 1st through November 23rd, 2019. Saturday (10 am – 2 pm), December 7th, 14th, and 21st, 2019. Every other Saturday (10 am – 2 pm), January 11th through April 18th, 2020. Please stay tuned for our 2020 application release date. Q: Do I have to participate in every Nourish Market? A: No. You apply to each Market separately. All vendors reapply for each Market every year. Acceptance in one Market does not guarantee acceptance into another. Do I have to participate every date the Market is held? A: No. You can select specific dates on which you would like to participate when filling out the application. Refer to the Vendor Handbook (link at top of page) for booth fees for each Market. Booth fees are per day, per space. All our Markets also charge a non-refundable application fee. What if I select dates and want to change them after submitting the application? A: You will email us with any requested date changes. Once you submit your application, you cannot change your own dates. What if I can’t attend a date I am approved for? A: We have a 1-week cancellation policy. Email us with cancellations at least 1 week before the selected date to receive credit for booth fees, [email protected]. Do you provide tents and tables? A: No. Each vendor provides his/her own setup. We do not require that vendors have a tent, but it is advisable. The Winter Farmers’ Market is indoors, so no tents are needed. Do you allow prepared food made in an uncertified kitchen? A: No. All prepared food must be made in an inspected kitchen. I don’t have an inspected kitchen. Can I rent or share someone else’s inspected kitchen? The outdoor markets are sometimes held in uncomfortable weather. Can I bring a heater or fan? A: Electric heaters and fans are not allowed at any Nourish Knoxville Market. Battery operated fans are welcome. Do I receive a refund if there is inclement weather at an outdoor market? A: No. All Markets are held rain or shine. 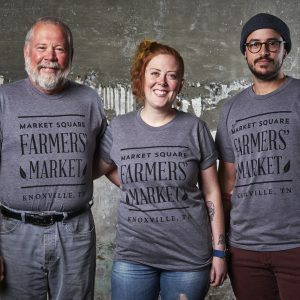 If Nourish Knoxville decides to cancel a market due to dangerous, inclement weather, all vendors will receive credit or a refund for that date. A: Yes, but only in select locations. If you require electricity, please make a note in your application. We will not be able to accommodate all requests for electricity. Please note: electricity for food trucks is available at the MSFM but not at the WFM. If you wish to have your food truck participate in the WFM, you will need a generator. A generator may be required for food trucks operating at the NHFM.